The Luxi Mattress is a uniquely designed luxurious mattress made up of superior quality materials and the latest technology. The mattress has a unique customizable feature that helps you swap the layers and get three different levels of firmness. The mattress not only provides unmatched support and comfort but also offers great motion isolation and a cool sleep. 1. What Kind of Mattress is the Luxi? 2. How is it Layered? 3. How is the Cover? 4. How Firm is the Luxi Mattress? 5. Does it Remain Cool or Become Hot? 6. Does it Smell Like Chemicals? 7. Will I Feel the Partner Moving? 8. Do I Need a Foundation or Boxspring for the Luxi? 9. How Durable is it? 10. Is it Easy to Clean and Maintain? 11. How Long is the Warranty? 12. Is There a Comfort Guarantee? 13. Does it Ship in a Box? 14. What is Luxi’s Price? 15. Is this the Mattress for me? The Luxi is a mattress manufacturing company that has been established in 2015 and has ever since transformed the mattress industry by producing an exceptional type of mattress. The company has been established by a father daughter duo who wanted to produce a mattress that was perfect for everyone. The Luxi mattress was introduced as the first-ever adjustable bed-in-a-box and has been produced using next-generation technology and superior quality materials and products. The mattress has been designed and developed to meet the needs and requirements of all types of sleepers, and provide them with a deep, restful sleep. It provides 100% satisfaction to almost all its customers with its unique 3-in-1 adjustability feature as the firmness of the mattress can be set according to the requirements of the sleeper using the mattress. The company has designed the mattress to change and adapt with the change in your requirements. This mattress is a luxurious looking high quality mattress that has been constructed with the best quality foams that provide top-notch comfort, superior support, great bounce, pressure relief, and a cool sleeping surface. The mattress provides a great balance between hug, contour, and support which improves spinal alignment and blood flow, and reduces joint pains. This mattress not only fulfills the needs and requirements of one sleeper but also provides an unmatched comfortable sleep to the other partner. Furthermore, both the partners can adjust their sides according to their comfort levels. The Luxi mattress is manufactured using an amalgam of 4 different superior quality layers and a high quality cover that total up to form an eleven inch high mattress. 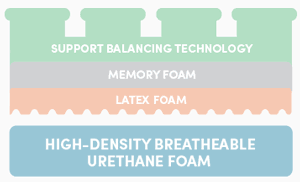 The first layer of the Luxi mattress consists of a Support Balancing Technology (SBT) layer which is made out of fabricated enhanced stability viscos foam heads to provide the right amount of support compression and body contour. This 3.5 inch layer has been uniquely designed to provide a long lasting durability, pressure relief, spinal alignment and minimal level of motion transfer. The second layer of this mattress consists of a 1.5 inch Memory foam layer which acts as a transitional layer between the foam heads and the latex to provide a balanced level of comfort and support. This layer has been crafted to provide the perfect level of sink and responsiveness and adjust according to the body weight to present proper spinal alignment and pressure relief. The third layer of the mattress comprises of a 1.5 inch Dunlop Latex foam that provides cooling and comfort to the sleeper. It is known as Luxitex Foam layer. This layer has an aerated design and has bee developed to provide great breathability and cool sleeping temperatures for the sleeper. This layer also presents a good level of bounce and resilience and creates a buoyant, springy feel all across the mattress. The final layer of the mattress consists of a 3.5 inch high density polyurethane foam which not only acts as a base and fundation for the mattress but also provides overall support and shape to the mattress. This layer has a breathable open cell structure designed to provide comfortable sleeping temperatures. The above layers have been designed in such a way that they can be switched around to achieve a comfort level of your choice and the larger sized mattresses, Queen, King, Cal king have a split design so that the layers can be customized according to each partner’s requirements and needs. All of the above layers are wrapped in a 1 inch quilted cover that is lined with memory foam, and provides plushness to the mattress. The Luxi mattress has a 3/4 inch thick quilted cover to be precise and has been made out of 4 different layers of materials. The cover has a 1/2 inch conventional memory foam that has been sewn into the cover and makes up for the quilted foam. This layer is quilted inside a 100% polyester material. There is a FR Fire Fiber Barrier under the white surface fabric which has been specially designed to prevent any fire related hazards. The surface fabric has been constructed with a blend of 73% polyester, 23% viscose and 4% elastane. The cover is highly elastic, breathable, and durable. 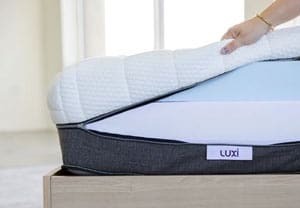 The cover of the Luxi has a zipper and is designed to be removable in order to be able to switch and swap the layers according to your preference, and it is recommended to keep the cover on once the desired level of firmness or softness has been achieved. It is not recommended to wash the cover of the Luxi as it has a thin layer of memory foam which has been sewn into it that may get damaged in the process. The top part of the cover is white in color and has a textured and a striped pattern and design. The white part covers most of the mattress while a small purple border covers the lower part of the mattress and runs all along the bottom boundary. The purple border is made up of 100% polyester. The cover has a waterfall edge design which ensures that the foam layers fit perfectly well when switched and the cover looks aesthetically enticing. The zipper is placed right between where the white part meets the purple border and allows you to remove the top part of the cover easily to access the foam layers. The cover is simply designed with high quality materials and looks attractive and appealing. The Luxi Mattress has been expertly engineered and designed using the latest technology to provide a mattress that can adapt and adjust according to the needs and requirements of the sleeper. The mattress is presented with a switchable design which means that the foam layers of the mattress can be swapped and flipped to gain access to a comfort level which is ideal for the sleeper. The mattress can be customized in a few easy steps by just unzipping the mattress and flipping the inside layers. The mattress can be adjusted either to a soft, medium or a firm level of firmness. The level of firmness in the larger sized mattresses can be customized for each side as all the Queen, King, and Cal King sizes come with a split design. This makes the mattress ideal for couples and people with partners who prefer different levels of firmness. In case you want a model without the split, then you can inform the company at the time of order and they will send you a larger sized mattress without the split feature. The company ships the mattress with a medium level of firmness by default unless you request another comfort option at the time of order. The medium level of the Luxi is about a 5.5 on the firmness scale, 10 being the firmest. In the medium configuration, the latex layer is on the top, memory foam layer and the SBT layer in the middle, and the polyurethane base foam layer in the bottom. This level of firmness is preferred by the majority of sleepers and is ideal for all types of sleepers. The firm level of the Luxi is about an 8 on the firmness scale, 10 being the firmest. This level of firmness is ideal for stomach and back sleepers and the people who prefer the mattress firmness on the firmer side. To customize the mattress from a medium to a firm level of firmness, all you need to do is take out the polyurethane base foam layer, place it over the latex layer, and zip the cover. The soft level of firmness in the Luxi mattress is about a 3.5 to 4 on the firmness scale, 10 being the firmest. This level is preferred by people who like a soft feel and enjoy a greater amount of sinkage. This firmness option is ideal for side sleepers. To configure the mattress from a medium to a soft level of firmness, just flip the top 3 layers so that the SBT layer with the foam heads comes to the top, memory foam and latex layers in the middle, and the polyurethane base layer stays at the bottom. In case you are not sure about the firmness level that suits your needs, the company suggests on using the mattress for a few days with all the levels of firmness. If still you have an issue with the comfort level then you can contact the company and they will design a custom element for the mattress according to your feedback, and send it to you free of cost during the first 1000 nights from the date of delivery of the mattress. The Luxi Mattress has been designed using the latest technology and has a unique design that not only provides overall comfort but also a cool sleeping surface. It has been crafted to provide its customers comfortable sleeping temperatures and is well known as one of the coolest sleeping memory foam mattress available in the mattress market today. The cover at the top has a breathable design that allows airflow and helps in providing a cool sleeping surface. The SBT layer has a series of channels that run through out the layer and help in dissipating heat through airflow, both from side to side and head to toe. All of the materials and layers used in the mattress have an open cell structure that helps in the in flow and out flow of air to keep the mattress cool and provide a comfortable sleeping temperature. The mattress is expected to be slightly cooler than most of its competitors due to the high amount of free airflow available in the Luxi. Research and reviews have shown that this mattress has been rated above average in this category and does not sleep hot. The Luxi Mattress does have a little off-gassing or new mattress smell initially when it is first unpacked. This smell is common and can be felt in almost all foam and latex mattresses. The cause of this smell is the instant compression and packaging done right after the mattress is manufactured. The new mattress smell gets trapped in the vacuum seal and starts dissipating when it is unpacked. This smell should not be a cause of concern for the users as it will soon dissipate completely in about a couple of days and will not be felt once it goes away completely. Luxi does not use any hazardous, harmful, or toxic substances in the construction of its mattress and therefore, no off-gassing or dangerous smell can be felt once the mattress has been set-up and allowed to air for a few days. The company uses superior quality foams in the construction of the mattress that are CertiPUR-US certified, thereby ensuring that no ozone depleters, flame retardants, mercury, lead, formaldehyde, phthalates, or other heavy metals have been used in the construction of this mattress. The Luxi Mattress has a unique construction that helps it perform really well in the motion isolation and sinkage tests. This means that the mattress provides minimal to almost no motion transfer. The SBT layer of the Luxi has individual foam heads that provide the right compression and body contouring by equal distribution of weight which helps in restricting motion to a particular area. The memory foam layer acts as the transitional layer and provides the accurate support required to absorb motion. The latex foam layer creates a buoyant, springy feel across the mattress and provides good bounce back to confine the motion to the particular area. All these layers work very well together and ensure an undisturbed sleep for couples and people who have partners that toss and turn all night, or move in and out of the bed regularly. Moreover, the larger sizes of the Luxi mattress feature a split design which means that the motion on one side of the mattress will stay on that side and cannot transfer as both the sides are different and not attached to one another. The mattress also provides a decent edge support that helps in providing a larger sleeping surface. Research and reviews have shown that this mattress has been highly rated for providing minimum motion transfer. The Luxi Mattress does not require a special or particular type of foundation or boxspring, and has been designed to work with almost all types of foundations. The surface should be hard and flat, and the Luxi will work absolutely fine. The mattress is compatible with almost all flat beds, boxspring, and slatted base beds, just make sure that the slats are not more than 4 inches apart. Before you place the mattress on the foundation, you must also make sure that the surface is flat and even, as an uneven surface will not provide the desired level of comfort and will restrict the performance of the mattress. The foam layers of the Luxi mattress are quite flexible and perform equally well with an adjustable bed. The mattress can also be placed directly on the floor in case you do not have an old foundation and do not wish to buy a new one. The mattress performs adequately well on the floor as well. The only thing to keep in mind while placing the mattress on the floor is to make sure that the area is not prone to moisture as this may harm the cover and the foam layers. The Luxi Mattress has been constructed using superior quality foam layers and the latest technology to provide a long lasting comfort and a highly durable mattress. The Luxi Mattress is completely manufactured and handcrafted in the US which ensures that the best quality foams and the finest materials have been used in its construction. The company rigorously tests all its mattresses and foam layers to ensure a comfortable sleep to its customers for years and years. According to the company, the mattress is anticipated to last for about 12 to 14 years before it requires a replacement. Luxi also offers a 10 years warranty with the mattress and is expected to last at least for this period. However, the mattress can last for a longer time if it is used appropriately and taken proper care of. The Luxi Mattress is very easy to clean and maintain as it has a removable cover. It is not recommended to hand wash or machine wash the cover as it has a small memory foam layer sewn into it which may get removed or harmed in the process but in case of stains the cover can be removed and the spot cleaning method is recommended. A sponge should be dipped into a mixture of water and a mild detergent and should be rubbed in circular motions over the stain until it comes off. This area should be dried off completely before placing back the cover. Make sure no harsh or harmful chemicals are used to clean the mattress. It is recommended to use a waterproof, washable mattress protector for the mattress as it will protect the mattress from any spills, dust, or stains and is easily removable and washable. The layers of the mattress are flippable and can be swapped easily according to your comfort level by unzipping the cover and setting up the layers accordingly. If you prefer a particular firmness option of the mattress then it is recommended to rotate the mattress from head to toe, every 6 months to present even wear. The mattress should be vacuumed using a hand vacuum after every 3 months to prevent any dust or dirt from settling in. You can also use a heating pad with your mattress if you like an extra warmth during your sleep. The heating pad does not harm your mattress in any way. The Luxi mattress has been constructed using the best quality components and the company believes in the quality of their materials, and therefore offers a 10 year warranty with the mattress. The warranty is non prorated which means that any manufacturers defect or a defect in craftsmanship that is observed or faced within the first 10 years from the date of purchase will be either repaired or replaced free of cost by the company. The warranty covers indentations or sagging that is more than one and a half inch- this is an industry standard for most of the companies. All transportation and handling charges for a warranty claim will be the responsibility of the customer but if the mattress qualifies for replacement then all the charges will be paid by the company. The warranty is valid only for the original purchaser of the mattress that has been bought from the company’s website or an authorized retailer. The warranty does not transfer in case the mattress is sold or gifted further. Research and reviews have shown that the warranty of the Luxi mattress has been rated average by the people as compared to its competitors. The Luxi Mattress is available with a 100 night risk-free trial and a 1000 night pledge. The 100 nigh risk-free trial means that the company will refund all your money if you do not find the mattress appropriate for you. The company requests its customers on using the mattress for at least 30 nights before making a decision as it takes time for the human body to adapt and adjust to new comfort levels, and it also provides the company enough time to collect a feedback and calibrate according to your requirements. The mattress cannot be returned before the 30 night break-in period is complete. In case you are not satisfied with the comfort levels of the mattress after the first 30 nights and before the first 100 nights from the date of delivery, then you can contact the company through email or phone during this time period and they will arrange for a pick up. Once the mattress gets picked up, the company will initiate a full refund of your money that you paid at the time of purchase and will not charge or deduct any hidden, shipping, or transportation costs from your refund. The 1000 night pledge ensures that the company will remain committed to you for the first 1000 nights and if you are unsatisfied with the comfort level, they will create a custom element that will either be denser, softer, or firmer according to your requirements in your feedback. In case you return the mattress, the company does not re-sell or re-use it. They donate the returned mattress to AmVets which is their primary charity. The return policy is only available to the original purchasers, who have purchased the product from the company’s website and not from somewhere else. The Luxi Mattress is handcrafted and made to order, therefore it takes between 3-5 business days to get your mattress ready and shipped. After the mattress gets constructed, it s compressed and packed in a vacuum sealed plastic. It is then rolled into a cardboard box and sent out for shipping. Compressing the mattress into a box makes it easy to carry and store. The size of the box depends on the size of the mattress you choose. The Twin, Twin XL and Full are shipped in a box with dimensions 44″ x 16″ x 16″ while the Queen, King, and Cal King are shipped in a 44″ x 19″ x 19″ box. The box is white in color and has the name of the company printed over it, and looks very simple and basic. The company recommends on opening the mattress right after you receive it. In case you want to store it for a while then it is not suggested to keep it packed for more than two months from the date of delivery as it may harm the foam layers and spoil the shape of the mattress. The company provides free shipping via FedEx to the mainland US, Hawaii, Alaska, and Canada. The company does not provide international shipping except Canada yet. It takes about 1 to 5 business days to deliver the mattress after it is shipped. This time totally depends on your location. If you want your mattress to be delivered on a specific date, then you can contact the company and they will gladly arrange for a delivery date that best suits you. In case you want a faster delivery then you can choose for Expedited shipping and the company will arrange a faster delivery service for you at an additional cost that will depend on your location and the desired delivery date. It is very easy to set-up the mattress once you receive it. All you need to do is unbox the mattress, place it on a foundation, cut open the plastic packing, and watch it expand. Once the mattress starts to decompress, it can take between 24 hours to 48 hours to fully expand and take its proper shape. The mattress arrives in the medium firmness option but can be changed by simply opening the cover and flipping or swapping the layers. The Luxi Mattress is constructed using superior quality foams and the finest materials but it is still available at a very affordable price. The company reduces the costing of the mattress by eliminating the middlemen and cutting off unnecessary commissions paid to dealers. The price of the Luxi mattress is directly dependent on the size the customer selects as the mattress is available in 6 different sizes. The company is presently offering a limited time discount offer with the mattress. You can avail a discount of $125 plus 2 free pillows with your mattress by using the coupon code TAKE125 at the checkout page on the company’s website. The Luxi mattress is a luxurious mattress that has been designed using the latest technology and superior quality foam layers that provide an unmatched level of comfort and support. The mattress has a unique design that helps you to switch and swap its layers and set them up according to your comfort. It provides three different levels of firmness that are ideal for almost all types of sleepers. The Luxi mattress is also preferred by people who do not accomplish a comfortable sleep due to acute or long term medical issues as the mattress can be adjusted according to a specific requirement. The company uses a special revolutionary comfort technology which is known Support Balancing Technology and is highly effective and unique. Luxi also backs up its mattress with a 10 year warranty, 100 night risk free, and 100% money-back guarantee. Furthermore, it offers a 1000 night sleep satisfaction guarantee which ensures that the company will make all the possible efforts to provide you with a comfortable sleep. The company provides a split design in the larger sizes which makes the mattress ideal for couples with different sleeping positions. The mattress also provides great motion isolation and sinkage, and is therefore ideal for people who get disturbed by the movements of their sleeping partner. The mattress does not only look appealing and attractive but also provides topnotch comfort, great support, good bonce, pressure relief, and a cool sleeping surface. The company also offers a giveback program where it donates a percentage of sales to the charity of your choice. The Luxi mattress, regardless of its high quality and its exclusive design and capabilities is available at an affordable price which makes it a great option to consider while buying a new mattress. Overall, the Luxi Mattress is highly recommended for the people in search of a comfortable mattress and are not sure about which level of firmness is ideal for them. Luxi is a value for money product and the extra $125 discount makes this mattress all the more affordable.